This week we attended an Artificial Intelligence (AI) tour in Finland. During the tour we met senior officials from across European public administrations and heard a number of success stories from AI companies. We also participated in the Ministerial AI Forum 2018 and visited the most intriguing of Finnish AI companies. The purpose of the tour was to offer an overview of Finnish solutions and policies regarding AI and the broader European framework. The tour started with an overview of the most relevant AI policies and projects in Finland. Ilona Lundström, director general of the ministry of Economic Affairs and Employment of Finland discussed the development of the AI steering group to prepare a proposal for an AI programme for Finland, which is going to be chaired by minister for Economic Affairs Pekka Ala-Pietilä. 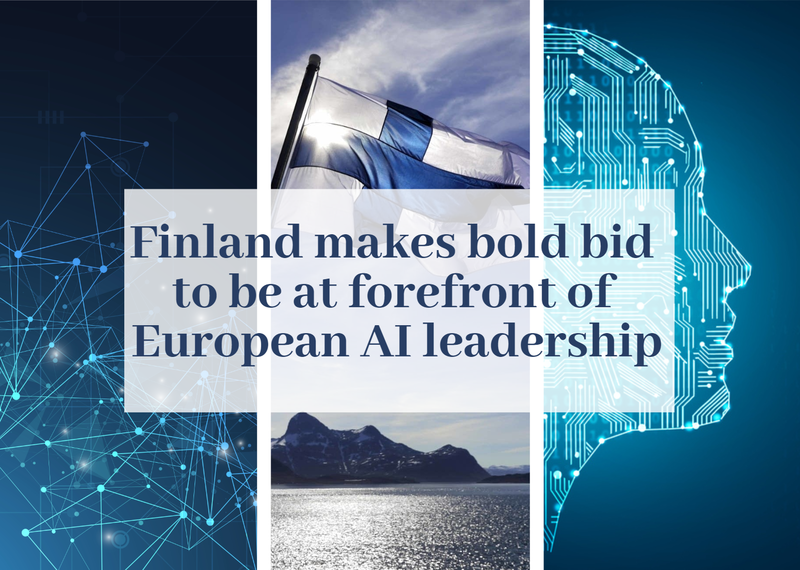 Lundström said that the AI steering group will be soon submitting its first interim report, which is likely to contain eight key actions taking Finland towards the age of AI. The Finnish minister for Economic Affairs is expected to present the key findings of the report and offer a glimpse into Finland’s strengths in AI. In the same event, we had a presentation from Aki Ylönen, Senior Advisor for Business Finland, highlighting the ‘AI Business’ programme that offers funding, networking and export services for research, development and utilising AI in business. The program will run from 2018 to 2022 with a total budget of £176m (€200m), of which Business Finland will cover approximately half. It was also announced that Business Finland will provide £53m (€60m) fund for the development of digital initiatives that have a significant “global networking impact”. Teemu Roos, associate professor of Computer Science at the University of Helsinki and Leader of the AI Education program in the Finnish Centre (FCAI) gave us an overview of the centre’s main activities and projects. The FCAI is a nation-wide competence center for AI in Finland, initiated by Aalto University, University of Helsinki, and VTT Technical Research Centre of Finland. Roos said that the FCAI’s ultimate goal is developing “real AI” meaning artificial intelligence that is able to work with humans and augment human capabilities to operate in a complex world. Roos also presented the ‘Elements of AI’ module, which is organised jointly by the University of Helsinki and the Finnish tech strategy firm Reaktor. The online course, introduces the basic concepts and applications of AI and machine learning in an “easily accessible way”. The module, which is one of the ongoing projects of Finland’s AI programme and is free to attend, have reportedly already enrolled 80,000 students including the country’s President of the Republic. Reaktor has been responsible for service design and user experience for the general public. The company, which has many other strategic-level projects with the University, has previously organised coding schools projects for children. The following day, we attended the AI Forum 2018 to hear European ministers and tech experts discussing the global race for AI, algorithmic transparency and the need to ‘reskill’ the European workforce. The ministerial conference on AI brought together ministers, political leaders from 22 countries, policy makers, experts and industry to establish a shared European vision for the development of AI across member states to ensure that union remains competitive in the age of artificial intelligence. “Finland’s national AI strategy was published 11 months ago. Free flow, fast access and operability of data are central topics of our national AI policy. Health data is one important example in our context, as we have collected systematically health records of each citizen for decades. When making decision on data policy, we need to take into account privacy,” Lintilä added. Following Lintilä’s opening remarks, the European Commissioner for Digital Economy and Society Mariya Gabriel gave a keynote address which emphasised the commitment of the EU to remain at the forefront of AI-deployment to create growth and competitiveness in Europe. Gabriel said, “We need to invest 20 billion euro per year for the next 20 years” to be a global player on AI. During the conference, I asked Commissioner Gabriel what she thought were the obstacles that could impact the development of AI in the EU. She replied that the major obstacles were the lack of coordination and share of resources between member states, shortage of digital skills and the absence of a clear set of ethical guidance. She said that the EU High-Level Expert Group on AI will be launching its AI Ethical guideline in December, which is expected to be adopted in March 2019. The Ethical Code will aim to preserve a “human centric approach based on value and principles” and to make sure that AI can really maximise the benefits for the European economy and society. At the AI Forum we also spoke with Risto Siilasmaa, chairman of the Board of Directors of Nokia, on the development of AI and machine learning in Europe. Siilasmaa warned that the EU’s General Data Protection Regulation (GDPR) risk becoming outdated less than five months after being put in place, and urged European policymakers to update legislation as more companies invest in AI. Siilasmaa said that GDPR was “largely designed before anyone in Brussels had heard the term machine learning”. He said there were “small things to fix” in GDPR and added, “We need to regularly update the rules and make sure they are cutting-edge and respond to these new needs”. To conclude the second day of the AI Tour we had a presentation from a number of AI startups such as Valohai, Silo.ai, Meru Health, HeadAI, Curious AI and DAIN Studios, who outlined their solutions and visions of tomorrow’s AI solutions. On the last day, we had a look at some of the most interesting AI hubs in the Finnish health technology ecosystem visiting the VTT Technical Research Centre of Finland, the Hospital District of Helsinki and Uusimaa (HUS), CleverHealth Network and FIMMIC. During the visit, it was stressed that the effective utilisation of AI relies on the availability of data. It was said that the strengths of the Finnish health data registries include their coverage, quality, longitude, and ability to connect data from different registries on an individual level. To end the tour, we spoke with F-Secure on how it utilises AI in information security.